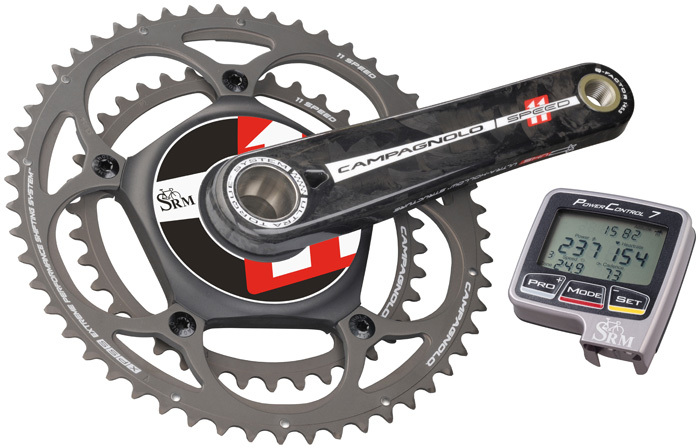 Colorado Springs, Colo. – SRM Training System is proud to announce the launch of the Campagnolo PowerMeter complete with distinctive PowerControl 7 aluminum head unit. Uli Schoberer, owner and founder of SRM, collaborated with the Campagnolo design team and engineers to develop a unique PowerMeter and crankset combination capable of delivering accurate and precise data while maintaining the superiority and classic aesthetics of the Campagnolo brand. Campagnolo designed an Ultra TorqueTM crank arm specifically for the SRM PowerMeter featuring an opening to access the retaining spring of the bottom bracket. The cranks will be available in 170mm, 172.5mm, and 175mm with a Q-Factor of 145.5mm. The Ultra TorqueTM is Campagnolo’s offering in the integrated crankset sector presenting “lightness, rigidity, and efficiency of power transmission.” With technology containing CULTTM (Ceramic Ultimate Level Technology) the SRM Campagnolo Powermeter will demonstrate maximum smoothness and wear resistance. SRM Campagnolo PowerMeter users will also benefit from Campagnolo’s X.P.S.STM shifting system (Extreme Performance Shifting System) guaranteeing superior speed and precision. The SRM Campagnolo PowerMeter has been race tested and approved by the Team Omega Pharma-Lotto. During the 2011 season the team trained and competed with the SRM Campagnolo Training System, contributing valuable data and feedback on the exclusive system. In addition, Philippe Gilbert and André Greipel won several races including stages of the 2011 Tour de France riding the SRM Campagnolo Training System. The design team at SRM combined rider feedback with research and testing, resulting in an enhanced accuracy of ±1.5%. An improved strain gage design, circuit components and manufacturing process are all important factors in SRM’s continuing innovation. As a testament to SRM and Campagnolo’s reliability, quality, and durability, a three year warranty will be included on cranks, bearings, PowerMeter, PowerControl, and batteries. The complete SRM Training System purchase includes the unique PowerControl 7 Aluminum (PC7) and all accessories (heart rate belt, speed sensor, multi-charger, download cable, handlebar mount, cadence magnet and SRM software). The PowerMeter Only option allows customers to purchase the SRM PowerMeter separately to be used with other ANT+SportTM compatible devices or for a second bike with a shared wireless PowerControl. The SRM Campagnolo PowerMeter is now available to pre-order with shipping on December 1st.